La Vanguardia, 28 October 1918, reports of the Prince Ibrahim Hassan. On Monday 28 October 1918, Egyptian Prince Ibrahim Hassan (Cairo, 1879 – Barcelona, 1918) died at his home in La Pedrera, No. 92 Paseo de Gracia. 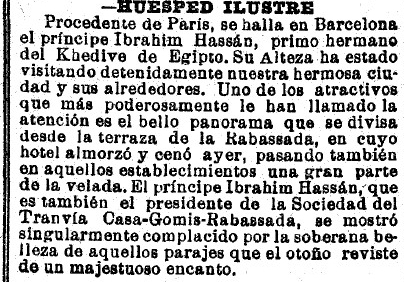 The prince, nephew of the Sultan of Egypt and grandson of Khedive Ismail Pasha, had long resided in Barcelona as the report in La Vanguardia the 28 October 1918. Educated at Europe’ best schools, he had resided in Vienna, Paris and London. Before his stay in Barcelona, the prince was president of the Cairo Electric Railways & Heliopolis Oases Company. A man of culture, Prince Hassan was a member of a number of societies including the Géographie d’É́gypte, the Royal Geographical Society, the Société Royale Belge de Géographie and the Société Royale de Géographie d’Anvers. In fact, although the story was true, the man was not Indian but an Egyptian prince. In the autumn of 1911, the local press mentions the presence in Barcelona of a distinguished visitor. 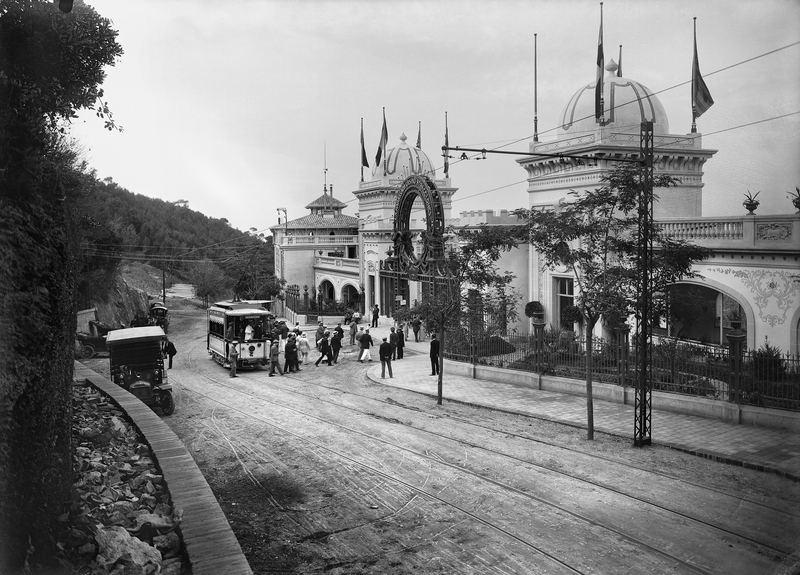 Ibrahim Hassan was a diplomat and businessman who in Barcelona served as president of the Sociedad del Tranvía Casa Gomis – Rabassada, which provided a tram service to the now-defunct Casino de la Rabassada. “DISTINGUISHED GUEST. Prince Ibrahim Hassan is in Barcelona, having arrived from Paris. His Highness has been paying an extensive visit to our beautiful city and its environs. One of the sights that most caught his attention is the fine panoramic view that can be admired from the terrace of the Rabassada, in whose hotel he took luncheon and dined yesterday, as well as spending a good part of the evening there. Prince Hassan, who is also the president of the Sociedad del Tranvía Casa Gomis – Rabassada, took great pleasure in the outstanding beauty of the vistas that autumn endows with a majestic charm.” (La Vanguardia, 1 October 1911). The illustrated newspaper L’Esquella de la Torratxa, lost no time in mentioning the prince’s stay in Barcelona, with its customary sarcasm. “Thanks to gossip that has been discreetly making the rounds in the Barcelona press, it has come to our notice that the president of Sociedad del Tranvía Ca'n Gomis – Rabassada is none other than a prince; Prince Ibrahim Hassan, first cousin of the governor of Egypt. The twists and turns of life! Remarkable! Such are the whims of History! ¡A descendant of the Pharaohs, capitalizing on the electricity business on the slope of our Tibidabo! The only picture of the prince was published on 5 October 1911 by the satirical weekly Cu-cut!. One curious episode in the prince’s life is when, in April 1911, he wed in London the American actress, Ola Humphrey. But the marriage only lasted about six months According to statements by Ola Humphrey to a New Zealand newspaper in December of the same year, her marriage had been a mistake. She accused the prince of keeping her “locked up” and of treating her like another member of his harem. The prince visited Barcelona in September 1911, probably accompanied by the actress, although we have no evidence of this. After the divorce, Ola Humphrey went to California where in 1915 she starred in the film Under the Crescent, based on her short-lived career as a princess. Of the film, directed by Burton L. King, with a screenplay by Nell Shipman and distributed by The Universal Film Manufacturing Company Incorporated, there is no extant copy. This contribution was the result of a brilliant ‘tip-off’ by Anna Buti. Khedive is a title equivalent to the governor of Egypt and The Sudan between 1867 and 1914.